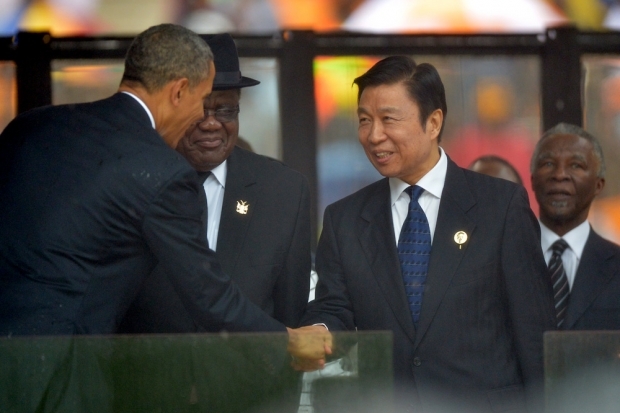 China’s Vice President Li Yuanchao (Right) shakes hands with U.S. President Barack Obama during South African former President Nelson Mandela’s memorial service in Johannesburg on December 10, 2013. There is a persistent meme within the international media that China’s rise in Africa represents a “new scramble” for resources on the continent or a new form of colonialism. Beijing-based China-Africa analyst and attorney Kai Xue says, contrary to this view, increased engagement of the Chinese and the U.S. in Africa, among other major powers, actually offers tremendous benefits for Africans through increased trade and development. He argues that the world’s two largest economies are “complementary rivals” on the continent whose interests don’t really overlap with one another.